Thomson's Rhododendron can be readily identified by its deep blood-red fleshy waxy flowers with a large, prominent sepal cup. It is named for Dr. Thomas Thomson, 19th century Scottish naturalist and superintendant of Calcutta Botanic Garden. Interestingly its leaves are not long and narrow like most Rhododendron species. Leaves are rounded-oval, 5-10 cm, with a rounded or shallow heart-shaped base. They are dark green above and glaucous beneath. It is an erect shrub, growing to 3-5 m tall. 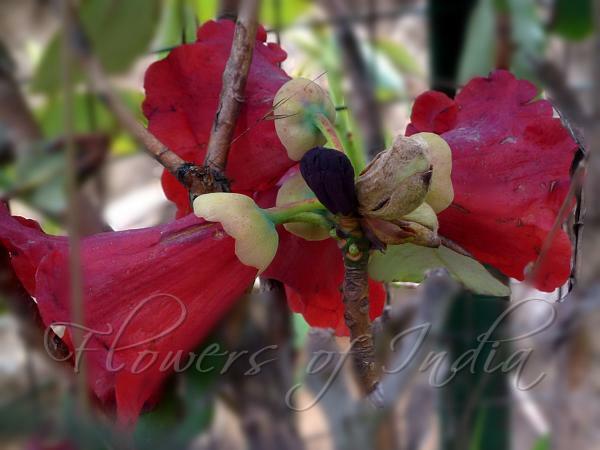 Flowers are beautiful, bell-shaped, 5-6 cm long, darker spotted, rounded, notched, overlapping petals. 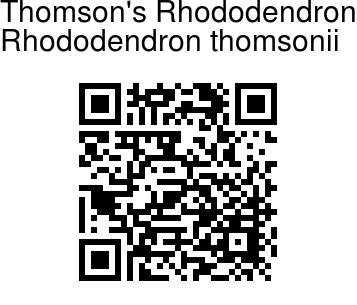 Thomson's Rhododendron is found in forests and shrubberies in the Himalayas, from E. Nepal to SE Tibet, at altitudes of 3000-3800 m. Flowering: May-June. Identification credit: Susmita Basu Photographed in Sikkim.